Elizabeth Kai, Manager of the National Food Authority (NFA)-Abra, gladly informed her fellow public servants that NFA has more than enough rice supply to support the province. 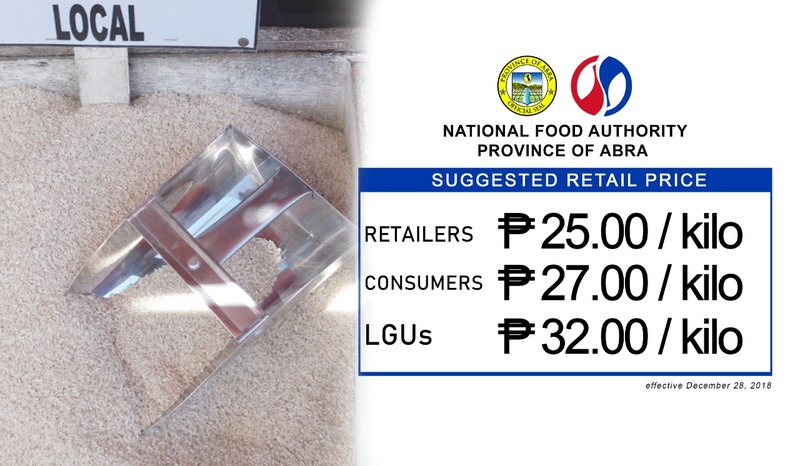 As of December 28, 2018, suggested retail price of NFA rice for consumers in the province is P27/kg, P25/kg for retailers, P32/kg for LGUs, and other institutions. She also said their department is now accepting accreditation for individuals and associations. For individuals, they must present a Department of Trade and Industry (DTI) permit as proof they are conducting business. For organizations, they must present a Cooperative Development Authority (CDA), Department of Labor and Employment (DOLE), or Securities and Exchange Commission (SEC) certificates of registration; and list of members, and resolution to transact business with NFA. Kai also introduced NFA’s newest lending loan assistance program to corn producers in the province. For more details, interested applicants may visit NFA-Abra office located at Brgy. Calaba, Bangued.